3) Prepare the patient with elopement equipment. The ALZ Store offers a variety of dementia wandering products that discourage roaming or alert caregivers when it is occurring. For those suffering with dementia, there is HELP. 2) The ALZ Store developed the first Fire Rated Door Mural that is approved for commercial facilities. It consists of a picture of a bookshelf that is so real, you have to touch it to know that it is a mural! 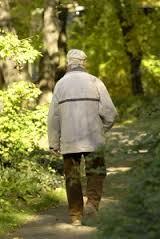 The dementia oriented person no longer sees a door to go through. This is great for hiding utility closets or basement doors. 3) At night, remote mattress alarms and indoor motion sensors can alert caregivers of a wandering loved one. Patient remote alarm pads can also be placed in a dementia person's chair for daytime observation. These products have remote alarms that do not startle the patient but do alert the caregiver who may be in another room that their patient is on the move. They even have 2 way intercoms so the patient can be spoken to. This can arrest the movement, giving the caregiver time to get to the patient. 4) GPS devices are the newest technology for wandering. The Alzheimer's Store distributes devices that are locked on the wanderer's wrist, such as the Freedom GPS Locator Watch. The Alzheimer's patient can be tracked from any computer, tablet or smartphone. The device alerts the caregiver on site or family members or caregivers in remote locations that there is a wandering event occurring and the location of the patient. 5) Our emergency medical alert bracelet is an ID bracelet with the international scanning icon. All emergency responders carry scanning devices. It is also equipped with a url address with the wanderer's personal pin number. This pin number allows the caregiver/responder access to all medical records or contact information that has been preloaded into it from a computer. All of these alert products are monitored by an emergency response center with personnel who are experienced and have specific training to respond to those with Alzheimer’s, dementia and memory loss. This type of experience is crucial in a time of emergency. Please call us toll-free at 1-800-752-3238 to answer any questions about our products for wandering.